The place where we spent last week is the Long Beach peninsula, an elongated spur off the southwest corner of Washington state. The peninsula is about 28 miles (45 km) long and 1.5 miles (2.4 km) wide, located within an area known as the Graveyard of the Pacific because of the number of shipwrecks that have occurred there. At the base of the peninsula is the place where the Columbia River and the Pacific Ocean meet. Although the Graveyard of the Pacific extends from Vancouver Island in the north to Tillamook Bay on the Oregon coast in the south, at this location alone, called the Columbia Bar, more than 2000 ships have sunk, some of them recently. 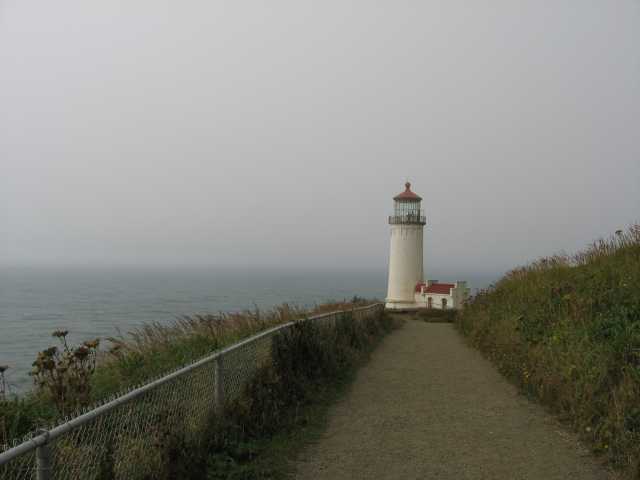 This is Cape Disappointment lighthouse, built in 1856 to prevent reduce the number of disasters at the conjunction of river and ocean. It was visible to ships coming from the south, but when shipping routes also began to go to, and come from, the north, it couldn’t be seen from that direction. Ships would overshoot the channel and crash on the rocks. The North Head light is visible from both north and south (as long as there isn’t too much fog). North Head now serves as the primary light, visible from 17 miles (27 km) out at sea. 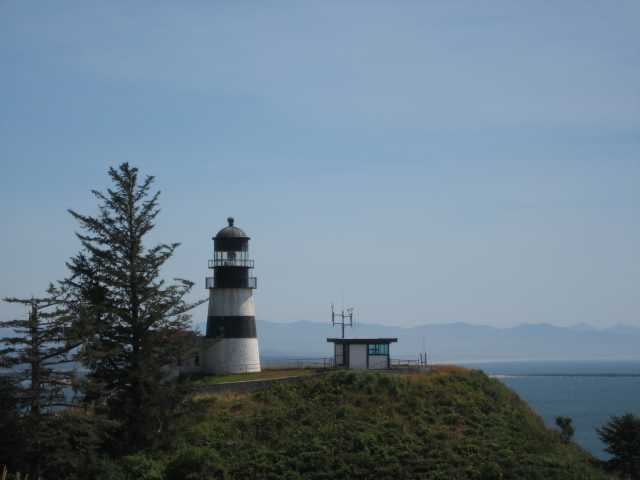 Cape Disappointment light is now a guide to ships in its immediate area. Tourist information acknowledges that while the beach along the extended peninsula can be fine (being aware of tides and storms), the water along this stretch is, as they point out, not very "user-friendly" for people as well as ships. 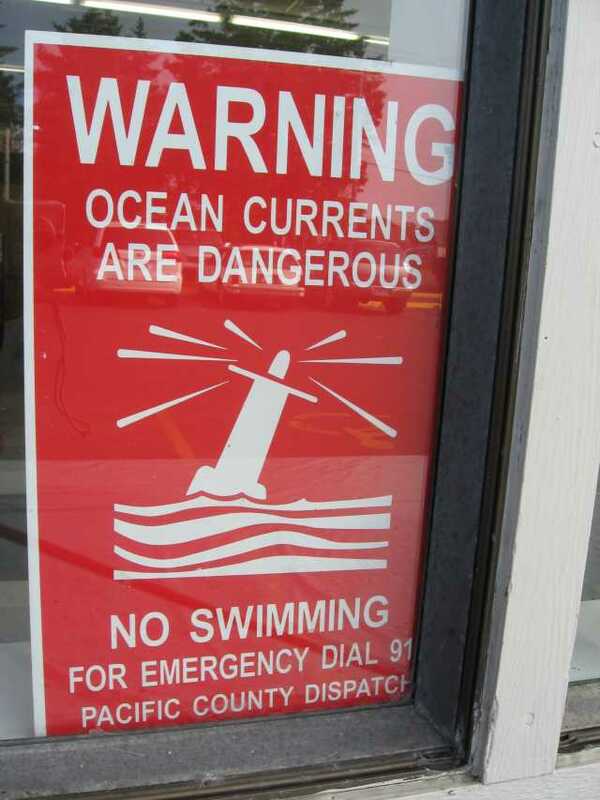 There are dangerous currents and riptides. The peninsula is a great place for kites and sand castles, but not for swimming or other water sports. The low-lying peninsula can be battered by weather, and in addition has the rare but significant potential of being suddenly inundated by a tsunami generated by either a distant or a local earthquake. Tsunami evacuation routes are marked along the highway; the goal in an evacuation is to get to higher ground . . . at least 50 feet (15 m) higher than the coastline. It’s a good idea to be aware of local conditions. As it turned out, the place we were staying was relatively close to what qualifies as "higher ground," even though the landscape looked flat to somebody who lives adjacent to the Rocky Mountains. See that hill the person is climbing? It is more likely to be rock and closer to vertical than the illustration suggests. We also have black widow spiders and rattlesnakes, not found on the Long Beach peninsula. In Ocean Park, which was within walking distance of our home base, we found the 1887 Taylor Hotel building. 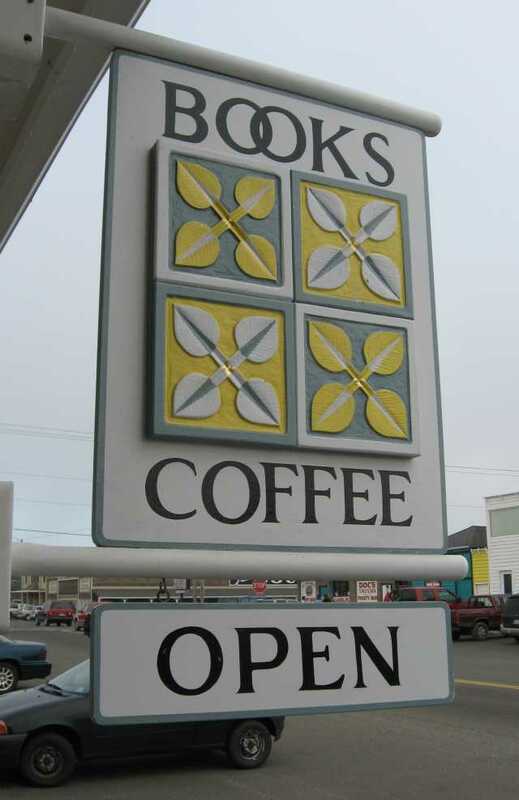 It now houses Adelaide’s, a lovely coffeeshop and bookstore: small and delightful. Free wireless access. Closed on Thursdays. Right down next to the water is Tapestry Rose, a yarn shop that shares a building (and owners) with the homey Full Circle Cafe. Tapestry Rose is exactly the kind of yarn shop that you want to find down the road from where you’re staying: useful stuff tucked into all the corners. Beach sand at the front door. 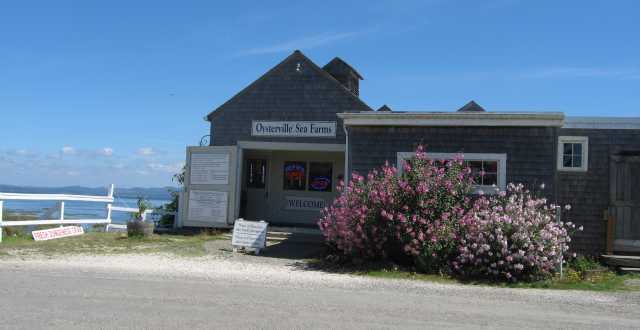 Anything else you might need can be found at Jack’s Country Store, if you walk a couple of blocks away from the beach. Great supply of oil cloth up in the attic. Swatches in the hardware department, then they’ll bring down what you want. But we came to town by way of Jack’s so we could walk back to our cabins by way of the beach. The sand is fine and soft. It’s good to check detailed landmarks from the other end before setting out, though, because the beach seems endless and you could walk all the way to Long Beach if you’re not careful. We guided by the half-burned log near the dune grass and the distinctive peak of one of the houses that was just visible over the grass from particular angles. 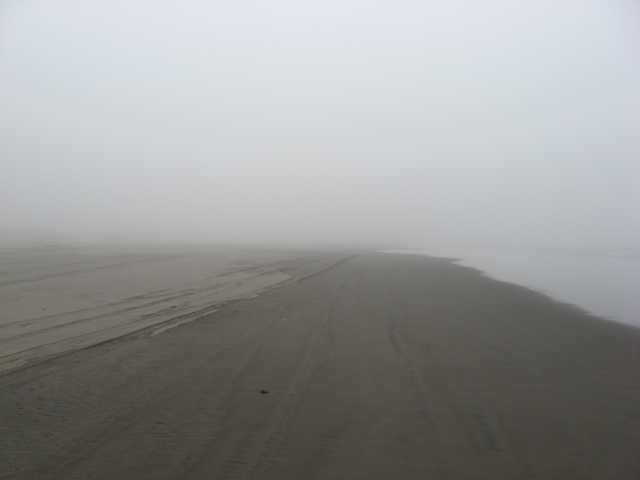 Except when the fog was thick. During our multi-state drive to Washington and back, we listened to a course on CDs. Called "Monsters, Gods, and Heroes: Approaching the Epic in Literature," it was presented by Timothy B. Shutt of Kenyon College. We borrowed it from the library and I’d link to the publisher’s web site, but it’s balky at best (Modern Scholar, now hosted by Recorded Books). Shutt discusses Homer’s Iliad and Odyssey, Virgil’s Aeneid, Beowulf, Dante’s Divine Comedy, Spenser’s The Faerie Queen, and Milton’s Paradise Lost, along with Shutt’s thoughts about the epic’s potential role in contemporary culture. Straightforward, clear, and sometimes funny. While we chose the course before we knew much about where we were going, the forces at play in the landscape we visited are definitely of epic proportions. The small bookstore at Adelaide’s stocked, among other things, TWO copies of Robert Fagles‘ translation of The Aeneid. Hardcover. In a past life, I read all of books 1 through 6 and parts of books 7 through 12 in Latin. I actually remember a bunch of what happened, but I’d be interested in reading the whole thing in English. I was tempted. It would be a good thing to read near the sea. But by the time I discovered it, we needed to begin our voyage back inland. You need a good long vacation. Probably something you have to plan four years in advance. I highly recommend taking a summer off. The past 7 weeks were (oi, don’t tell Dom I said this because he missed 5 of these weeks), quite possibly the best of my life. I like that Modern Scholar series, don’t you? I load them on to my ipod and listen in a variety of places. I listened to Masterpieces of Medieval Literature by Timothy Shutt earlier this year. The most recent one I did was Archaeology and the Iliad, which I found quite fascinating, though still with questions to answer.